LandOcean Energy Services Co., Ltd (LandOcean) serves the Oil & Gas industry through a comprehensive range of high-end services, equipment, and software development. 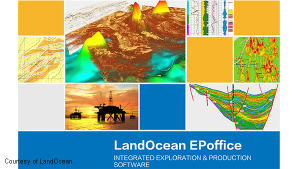 LandOcean have integrated the Open Inventor® 3D SDK technology into their E&P software suite called EPoffice. The LandOcean R&D Team selected the Open Inventor software development toolkit to help them harness complex 3D visualization challenges. “Displaying and depicting extremely large scale seismic data is beneficial in every solution of EPoffice", says Deng Lin, R&D director at LandOcean. “Using Open Inventor’s VolumeViz extension, we developed an advanced 3D volume visualization application (“ResViz”) which is used across the entire EPoffice suite”. 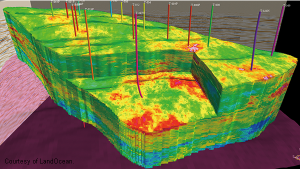 VolumeViz delivers state-of-the-art image quality, and its Large Data Management technology enables access to out-of-core data with optimized multi-resolution management. 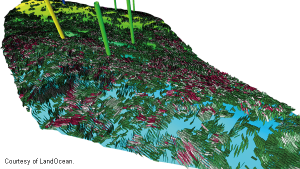 LandOcean also integrated Open Inventor’s MeshViz 3D-grid visualization technology into their new geologic modeling software “EPoffice LandMod”. Supporting extremely large data, Open Inventor advanced mesh API (MeshViz XLM) includes powerful memory management that allows the interactive rendering of several-hundred-million cell grids, on-the-fly geometry or property generation, complete data mapping functionality, among others. LandOcean Energy Services Co., Ltd (LandOcean), located in the Silicon Valley of China, is one of the largest listed joint-stock oil service companies in China specialized in oil exploration & development and relevant software. The company serves the oil and gas industry in a wide scope – from technology research on oil & gas exploration, development and production, to R&D and more. Images and text are courtesy of LandOcean. ↑ Advanced seismic data interpretation. Software: EPoffice SeisTalk. 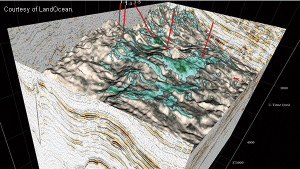 ↑ Rendering of geological model. Software: EPoffice LandMod. ↑ Fractured reservoir prediction, showing orientation and intensity of fractures. Software: EPoffice FRS+.